Are you ready for a laugh today? When I started blogging I actually thought, "I will just write what's on my mind this is going to be easy." At the time I really didn't care that no one was reading those thoughts, literally NO ONE!! Then came the inevitable, I checked my stats and actually saw in black and white that NO ONE was reading my blog. Next came research on how to drive traffic to my blog, and the main thing that came up over and over again was Social Networking Sites. So now in addition to keeping up the blog I have to manage Facebook, Twitter, Google+, Stumbled Upon, Digg, Pinterest, Disqus... To be honest with you, I don't have time for all of that. So here is my question, how do you manage all of the social networking and blogging, while still finding time for your real job and family??? First of all DON'T try to do it all!! Figure out which social network is best for your blog. How do I do this? you ask... Great question!! Ask in a blog post, have your readers answer in the comment section or set up a poll. Tweet a new blog post, then a couple of hours later post on Facebook. Which drove more traffic your way? 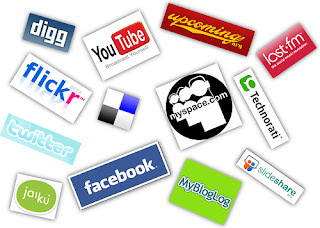 Ask on Facebook, Twitter, Google + or even a message board popular with your blogging topic (i.e. Two Peas in a Bucket or DisBoards). Check your Google Analytics to see where your traffic is coming from. Once you know where your readers like to socialize use it to your advantage and be most active there, be sure to post all new site activity there too. Don't ignore the other social networking communities, just focus most on the one where your audience is. Be active (repeating this for myself - be active!!). I am worse than anyone else in the world when it comes to Tweeting or posting on Facebook. Quite honestly, especially here lately, life has gotten in the way of my blogging and social networking. That being said, there is no acceptable excuse for being absent from your audience!! The quickest way to lose readers is not posting...putting myself in the corner for bad behavior, be back soon. Sorry about that, I'm back now. So what do you do to stay active when you're already doing a million things at once? Take advantage of scheduling Tweets and Facebook status updates using Social Networking Dashboards. The two most popular choices are Hootsuite and Tweetdeck. Here is a good post from Jonathan E. Smith comparing the two. While scheduling future posts is great, you still need to be present and active in current conversations. Try to set aside some time each day to see what everyone in your niche is talking about and join in on the conversation. Now, my sincerest apologies for being behind on connecting with you here and on Facebook and Twitter. I am truly honored that each of you stop by and ready my little blog, there are really no words to express how much it means to me. I am pretty confident that I already know the preferred Social Network most of you use, but to be absolutely sure please answer the poll listed in the sidebar. Donna- Can I just say "ditto"? Thanks so much for sharing Jonathan's piece- that's a help!! Thanks D!! His piece is really great isn't it? Great read.... something I needed to hear today. Now, can you find me some time to write my own blog, keep up with Social Media, write for other sites I'm a part of AND read/ comment on my friends blogs?!?! I just don't have the time and supporting my friends is what usually takes the back seat and I HATE that! Beth, I could have written this myself!! This is exactly how I am feeling right now. I have posts for WDW Fan Zone and the Red Loop this week!! I feel like I am such a bad person because I can't find the time to read and comment these days. If I figure it out I will let you know.